It all started with peanuts. In a sweet and praiseworthy act of loyalty, a young Harland Miller deliberately sabotaged his 11 plus exams to stay close to his best friend, Dean Robinson. Ironically, his friend ended up passing, whereas Miller ended up in the remedial group, commonly referred to as peanuts. Because these kids were effectively seen as write offs, any sign of talent was encouraged, and Miller, showing a flair for art, was asked by his teachers to mock up keep-tidy posters. If it wasn’t for peanuts, who knows, regular attendance in class might just have restricted his creativity. This is just one of many anecdotes that Miller recounts throughout the duration of our conversation, revealing a man who has both a knack for telling stories and a penchant for good conversation. He is loquacious and digressive but engagingly so, and if it were not for time slots and parking metres to rattle against, I would quite happily have talked till the sun came down. I meet Miller on the morning of the launch of his solo exhibition at the Baltic. Entitled Don’t Let the Bastards Cheer You Up, the show is a collection of paintings made or adapted specifically for the gallery, and includes his signature bad weather paintings and re-imagined Penguin classics, three new pieces dealing with the legacy of the Yorkshire Ripper, and four actual typewriters on plinths. There is a strong theme of words and writing, which given Miller’s talents as a writer, is hardly surprising. This was fairly rudimentary at first, but a visit to England to see his dad, who was suffering from a type of dementia similar to Alzheimer’s disease, changed his way of recording things. This prompted Miller to write “These great complete diaries” in case something were to happen to him, but they soon developed into something that was much more profound that mere records. Miller still effectively a painter first and foremost, but on arriving back to England in the early 90s, he found that London was in the grip of conceptual art, the so-called era of the Young British Artists. “Painting as I did it was really like the opposite of what was going on, which was very hard-edged. This was the time when Damien and Jay started doing their thing, which was great for the art world in terms of the interest it generated, but it wasn’t great for me because at the time painting was very much a no-no and it wasn’t fashionable. I couldn’t really get anyone to look at my work, show it, write about it, curate it, or buy it… it wasn’t that people disliked it; it just didn’t have an outlet. He had already developed the technique and style that he would eventually become famous for, a sort of quintessentially northern English abstract expressionist pop art signature that echoed the likes of Ed Ruscha, Robert Rauschenberg, and even Andy Warhol, but simply put, the timing wasn’t right. After going back and forth in between writing and painting, he found a way of combining the two. Words still figured, he was after all painting book covers and bad weather paintings with edgy, funny, and satirical adaptations of classic titles and tacky slogans endemic throughout the UK. It was this work that would bring him to the mainstream art audience. There’s something of a mischievous romanticist in Miller. He’s wearing aviator glasses, tweed pants, and brown cowboy-like boots, which all reference vintage styles. 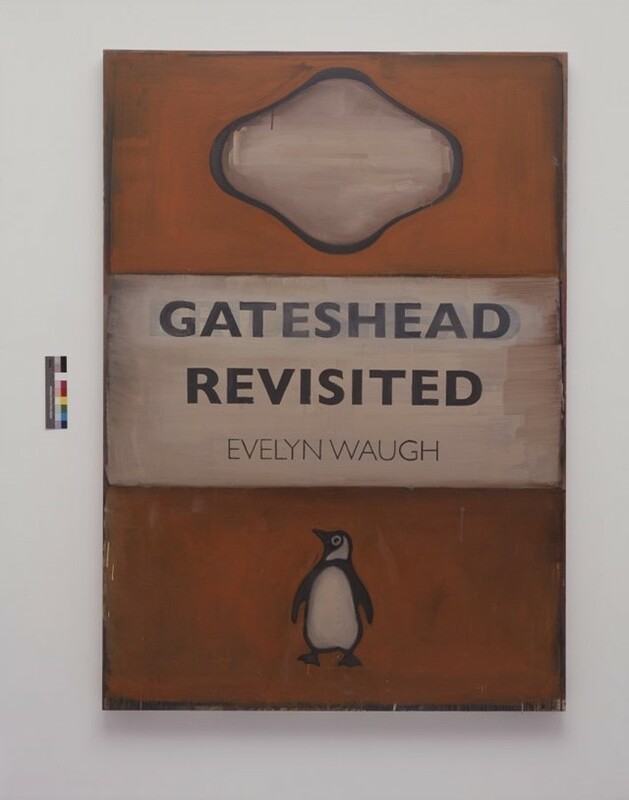 He has typewriters on show – splattered and drowned in luminous paint – and as has already been said of his work, there is a strong sense of nostalgia and wistfulness emanating from the paintings at the Baltic. Indeed, a lot of what Miller does is set in the past or responds to themes of heritage and history. Take for example his new work, The Consequence of a Failed Illusion (I, II, and II). These three paintings not only recreate the physical realism of decaying posters succumbing to the force of nature, but they also reconstruct the climate of fear that existed during the time Peter Sutcliffe was committing the murders. They’re noticeably darker than his other work. The images are decrepit, sinister, and poignant because of both his Yorkshire roots and the connection of the case to the North East through the pathetic and tragic actions of Wearside Jack. He’s a man of many words and although you wouldn’t think it on first impressions, his art goes much deeper than the depth of the canvas on which they’re painted. Spend some time at the Baltic and get to know what Miller has to say.